Discussion in 'SciFi & Fantasy' started by ricrery, Oct 8, 2009. What difference does that make. You said the tau didnt get crushed so the imperium couldnt divert any troops to destroy the feds but the eastern fringe is under attack by the tyranids and many many other species so the damocles crusade doesnt work as an example. The reinforcements for the damocles crusade are called back due to tyranids. It makes a great deal of difference. The Imperium has a shitload of ships, yes. That I do not deny. However, they have to spend most of those ships protecting their own territory and reinforcing planetary defenses. In addition, it takes decades to gather a massive warfleet for most major crusades. And they don't all arrive at once. You're not going to see 20,000 Imperium warships pop over to the UFP one day. It's going to probably be a few hundred or thousand over the course of a decade. The Imperium typically deals with large scale wars as a war of attrition. The tau codex only shows a selection of worlds. It does not show them all, for example only two third phase worlds are listed but there are hundreds. Humanity in the 23rd century lived on a thousand. To give you an idea, in 2069, humanity had colonized Luna, Mars, and had a few asteroid bases. By 2078 they established their first colony on Tera Nova (that didn't go so well...). By 2267, Kirk told Cochrane that they had spread to over a thousand worlds since his absence (looong story). So in roughly two hundred years after gaining warp technology, humans alone have spread to a thousand worlds. And keep in mind by the time of the 22nd century, Earth only had maybe a few dozen or so. I expect by the 24th century that the entirety of the Federation itself probably has tens of thousands of worlds. We also know that in a full on war against the Dominion, the Federation was expected by highly intelligent genetically altered humans that the Federation would suffer 900 billion casualties. And of course, that's presuming that there's still people for the Dominion to rule over, so the Federation's population is a great deal higher than that. Assuming that's a 50% casualty list of the population, the Federation has a population of about 1.8 trillion, though I think we could probably go as high as 3.6 trillion; a quarter of the population. So roughly 2-4 trillion people. Still, to keep it conservative and given that populations probably aren't growing at a massive rate, you can probably expect that the population is 1.8 trillion. Tau space is densely populated with habitable planets inside the Damocles gulf so their territory is isolated initially. No scale is given for the map so i would like to know how you know what area it covers. Ah seems, they're in an area densely populated with habitable worlds. Still, they seem to think that taking dozens of human worlds is a massive achievement to their expansion. A single ork battlekroozer can carry hundreds of thousands of orks and ork space hulks are commonly shown as carrying millions. All waaghs build up from small to large. Having a holodeck will not help sf against orks so can you explain what tech advantage will do to offset the military power of ork? personnel are snuffed out in an instant. A unit that survives a Planetary Bombardment immediately breaks and flees the battlefield unless there is an embedded Explorer who makes a successful Arduous (–40) Command Test to get the survivors under control. Anyone caught in a Planetary Bombardment takes damage as normal and with the usual benefits of armour, cover, and the individual’s Toughness Bonus. This damage cannot be dodged or parried. If they are not killed outright, they are surely at death’s door and will need immediate medical attention if they are to survive. The GM should also feel free to apply other conditions or effects, such as deafness, mental trauma, or permanent crippling, to the survivors as he sees fit. with no chance of survival. However, the ensuing blast wave affects an area of roughly one square kilometre, setting buildings afire, boiling away bodies of water, and leaving little behind but ashes and molten stone. Damage: Large units 75+5d10 Unit Strength. Individuals and vehicles 5d10+10 E; Pen 6 (unless the individual is within the initial impact radius, at which point they die, and must spend a Fate Point). • Macrobatteries: Macrobatteries saturate their target with massive, hab-sized artillery shells, missiles, seething plasma energy, or crackling las beams. Like a lance, each separate shell or energy blast affects a relatively small area of little more than a few dozen metres across, and anything directly hit is completely destroyed. However, the sheer volume of fire and the ensuing kiloton explosions, raging plasma fires, and hellish blast waves affects everything within ten square kilometres. Damage: Large Units 40+5d10 Unit Strength. Individuals and Vehicles 4d10+5; Pen 4 (unless the individual is within the initial impact radius, at which point they die, and must spend a Fate Point). torpedoes, and other Exterminatus weapons fielded by the Imperium. These types of weapon are outside the scope of these rules, and typically beyond the grasp of even the wealthiest Rogue Trader dynasty. together, resulting in the characteristic release of energy. a Galaxy class antimatter pod rupture. 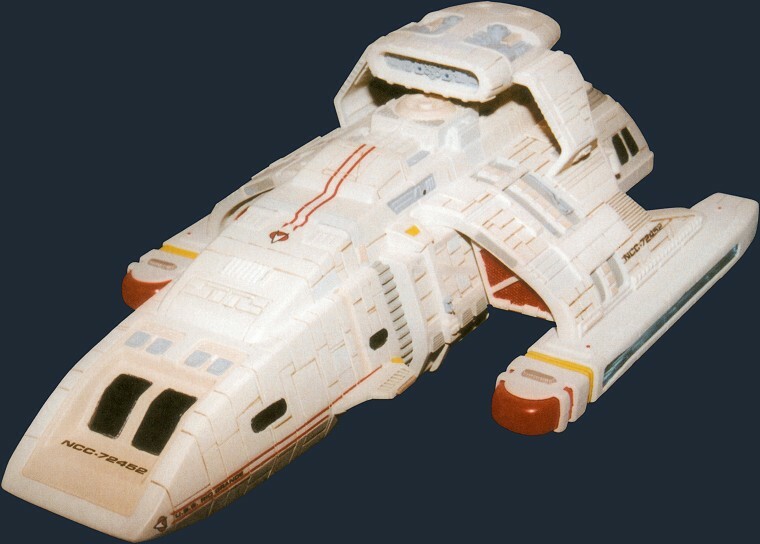 The basic external configuration of the photon torpedo carried onboard Deep Space 9 and its attached starships has changed little from 2271 to 2375. The body is an elongated elliptical tube fabricated from molded gamma-expanded duranium and a plasma-bonded tritanium outer skin. The current casing measures 2.1 by 0.76 by 0.45 meters and masses 186.7 kilograms dry weight, slightly less than the previous design. Penetrations by phaser cutter are still provided for warhead reactant loading, hardline ODN connections, and propulsion-system exhaust grills. The standard internal components include deuterium and antideuterium supply tanks, central combiner tank, and their respective magnetic suspension components; target acquisition, guidance, and detonation assemblies; and warp sustainer engine. The hafnium-titanide supply and combiner tank shells have an increased capacity of 5 percent, resulting in a slightly higher explosive yield, now rated at 18.5 isotons. Reduced optronics component complexity had driven the tankage increase. Since the theoretical yield of antimatter/matter reactions is 64.44 megatons, the yield of a typical photon torpedo would be 48.33 megatons. Even if we assume that only a quarter of that energy is going to hit the Imperium ship upon impact, that's 12.08 megatons. A few megatons can take down a layer of shielding from the macrocannons. A dozen megatons from a single torpedo is going to punch right through those Ork shields. Then of course, we also have the phaser. This is where the TM gets confusing. First, we're given two different power levels for each one. On the one hand, the personal phaser indicates that its power output is along the lines of 1.55 x 10(6) for its discharge energy. That would seem to implicate 1.55 megajoules. But in the weapon phaser section, even the type II's are rated as having .01 MW. They both can't be right and it's obvious what each one means. However, if the torpedo issue told me one thing, it's that this guy doesn't do so well when you write energy in its abbreviated form. Upon further consideration, a producing 1.55 megajoules is also pretty high. Especially when you compare it to a ship-mounted phaser that's much larger. So I'll go with the lower figure on the hand phasers. This gives your basic Type II an output of 10 kilowatts. At this level, a discharge at .28 seconds will destroy (blow up) a 630 cubic meters of rock. This is equal to destroying a 10.6 meter asteroid. Going with a hard granite for the rock and assuming cratering energy, the output of a phaser would equate to a .2 ton bomb--or the equal of roughly 836.6 megajoules. If you were to maintain the firing rate for 1 second (note, I am not saying that this is possible, megawatts determines the rate of energy, not the total energy outputted), it would equate to 2.988 gigajoules, or roughly half a ton of explosives. A single phaser array element is 510x more powerful than that, so it would destroy 331,500 cubic meters of rock. This is roughly (I try to keep it lower so as not to go over without spending forever on it) equal to destroying a 85.6 meter rock via cratering. Which is equal to 113.5 tons of TNT. This comes out to 1,104,605,357.14 cubic meters of rock being destroyed. Using a hard granite asteroid with a volume of 1,100,000,000 cubic meters, the cratering energy is 379.5 kilotons. Equal to a 1,280 meter sized asteroid. This of course, would only be from a 1 second sustained blast on the target. So, a typical pot shot from GCS's main phaser array (ie, the largest one had ~933 elements on it, where as others can have as few as 18), would equate to probably about 100-380 kilotons. However, the GCS's arrays have a maximum operation time of 45 minutes. Interestingly enough, it would mean that the Enterprise D could destroy up to 2,982,434,464.278 cubic kilometers of rock. To compare, Earth's moon, Luna, has a cubic mass of ~22,000,000,000 kilometers. So with its main phaser array, the Enterprise D could destroy a volume equal to just over 1/10th the moons volume. It could probably bump it up to 2/10th with its secondary array. The Type Xs, which the GCS uses, is the heaviest phaser design of them all--to be fair. The Type VIII that the Excelsior class used for example, is presumably going to be lower in pound for pound firing than a GCS element. Probably closer to 2-3 megawatts per second. However, you can expect the Akira, Nebula, Nova, Intrepid, and similar new ships who make use of the same phaser arrays to produce similar level of outputs from their emitters. But Excelsior, Miranda, and Centaur will have a much lower output rate and possibly a lower endurance rate (though I can't imagine they'll fall below 25 minutes). Dimensions: Varies; 4.5 km long approx, 1.1 km abeam approx. regularly identified over the centuries. The Kill Kroozer mounts gun batteries of various sizes, and is a common sight in Freebooter fleets. kroozers may conform to one of these configurations, or mount other weapons such as torpedo tubes or crackling energy weapons. This is the work-up for a typical Ork Kroozer. Take note of the highlighted portions; its acceleration is rated at 2.7Gs. Now, let's be clear before we go forward. 2.7Gs is downright amazing. This thing is roughly 4.5 kilometers in length and has a mass of 30 megatonnes. And it can presumably perform these accelerations without throwing the crew around. 2.7Gs translatees into 27 meters per second (1g = 10 meters a second). This ship can presumably accelerate to a maximum velocity of about 106.77 km/s to 247.35 km/s. That equates to roughly .03559c to .08245c. 1c of course, being the speed of light. This is based upon the stated distance of crossing the distance between Earth and Luna in an hour and the distance between Earth and the Sun in roughly two weeks. even with exhaust products accelerated to near lightspeed. stresses and local variations in inertial potential. Ie, the Enterprise D, if it really books it, can possibly exceed 1,000g of acceleration (ie, 10 km/s), though we can probably determine that 1,000g is probably the standard max for the Galaxy Class. Then you get to the whole issue of combat range. Now, 40k ships can engage at ranges of tens of thousands of kilometers. Your average macrocannon for example, has a range of 6 VU. In the game, it indicates that as a note, this is 10,000 kilometers per 1 VU and a weapon can fire at a distance up to double its range with some expectation to hit, suggesting that the macrocannons have a range of 120,000 kilometers. Some weapons, such as the sunsear laser batteries, can even hit as far away as 180,000 kilometers! Lances however, seem to be limited to ranges of 5-6 VU or 100,000 to 120,000 kilometers. Battlefleet Koronus also gives us ranges on Nova Cannons and Torpedoes. Torpedoes in this case, appear to have a combat range of 60, but unlike other weapons, it can only travel at its max combat range. However, regardless that gives us a max range of 600,000 kilometers. Your average Nova Cannon seems to have a range of 6-40 VUs, or 60,000 to 400,000 kilometer ranges. I'm not entirely clear on if that can be hurled at double ranges, for 800,000 kilometers. given by responsible officers to act against designated targets. which drives the phaser arrays with the best target coverage. lay in the rapid total annihilation of the torpedo's warhead. rate of particle annihilation was quite low. This is the shorter range version. It has a range of 750,000 kilometers. Keep in mind that this out ranges every Imperium weapon with the possible exception of the Nova Cannon. This one, which came about roughly fifty years later, has a range of 3.5 million kilometers. That said and done, while a starship could snipe at those ranges, it'll probably shift close enough to be able to use its phasers effectively. However, one thing should also be noted. While ships in Trek tend to move closer tens of thousands, thousands, and hundreds of km--even closer, these are also against ships that can move at 1,000G+ accelerations (smaller ships can apparently move faster at acceleration speeds than the Galaxy class, even the older transport that Scotty was found on). In addition, these ships are much smaller. The largest Alpha-Beta power is the Romulan Warbird, which is a kilometer in length and the Galaxy is just over 600 meters in length. And these are heavy cruisers/dreadnoughts for the Romulans and the Federation. Compare that even the Sword Frigate is 1.6 kilometers in length; roughly three times the length of a Galaxy class. Can you post where it is said that the borg are testing the federation by sending a single ship to get new methods of adaption? GUINAN: I wasn't there personally, but from what I'm told, they swarmed through our system. And when they left, there was little or nothing left of my people. RIKER: Guinan, if they were that aggressive, why didn't the Borg attack? They could have but they didn't. GUINAN: They don't do that individually. It's not their way. When they decide to come, they're going to come in force. They don't do anything piecemeal. ARTURIS: In your colourful language, yes. Species eight four seven two. Did it ever occur to you that some of us in the Delta quadrant had a vested interest in that war? Victory would have meant the annihilation of the Borg, but you couldn't see beyond the bow of your own ship! JANEWAY: In my estimation, Species eight four seven two posed a greater threat than the Borg. ARTURIS: Who are you to make that decision? A stranger to this Quadrant. JANEWAY: There wasn't exactly time to take a poll. I had to act quickly. ARTURIS: My people managed to elude the Borg for centuries, outwitting them, always one step ahead. But in recent years, the Borg began to weaken our defenses. They were closing in and Species eight four seven two was our last hope to defeat them. You took that away from us! The outer colonies were the first to fall, twenty three in a matter of hours. Our sentry vessels tossed aside, no defense against the storm. By the time they surrounded our star system, hundreds of Cubes, we'd already surrendered to our own terror. A few of us managed to survive, ten, twenty thousand. I was fortunate. I escaped with a vessel, alone, but alive. I don't blame them, they were just Drones acting with their Collective instinct. You, you had a choice! A few things to note. First, Arturis's own people are much more advanced than the Federation. Their quantum slipstream could actually travel 60,000 LY in three months. That would make their ships capable of 240,000c. Compare this to Voyager, who at high warp (and one of their fastest ships to boot) could in theory make that same trip in about 70-75 years. Perhaps less with a proper navigational route (stars and subspace can vastly reduce or increase a ship's effective velocity, actual warp figures are "average" calculations). Arturis indicates that the Borg had been wearing them down for centuries until the Borg finally decided to come for them; in that case, they brought hundreds of cubes. And keep in mind that this is after they suffered a heavy war with 8472 and were on the verge of complete loss. If the Borg Collective wanted the Federation that badly, they could have sent a dozen or hundreds of cubes and they'd effortlessly win. Where is it shown that torpedos are immume to phasers? I never said they were entirely immune. That doesn't even make sense. However, they are shielded--or otherwise insanely durable considering that a torpedo in Half a Life were able to penetrate into the stellar core of a star. Also, at closer ranges, a torpedo detonated by a phaser causes some weird, bizzare subspace shockwave. Also 40k torpedoes are heavily armoured. Which is pretty dumb when you consider that would just make it easier to lock onto them and drill in, setting off the warhead. It's better to have a faster, more fragile missile than it is a tougher, but slower one. Especially when they likely aren't to have amazing levels of acceleration given what their ships are limited to. Honestly...the Enterprise D itself might have near or greater acceleration capabilities than the Imperium's own missiles. Trek energy weapons can be blocked by throwing physical matter in the way as well. ...Okay? What can't be? Assuming it has sufficient enough mass and durability. Tyranid ships use energy blasts and arcing energy strikes to destroy incoming ordnance in Warriors of Ultramar. Okay...that's not the same as using psychic energy to create a force field or anything. While interesting, even if they do blow up the torpedo, causing an immediate detonation at close range, the photon torpedo is still going to hurt. Unless it's several kilometers. How far away do they detonate? Even after the codex introduced the compressed gravity corrriodor tyranids are written using warp travel as well. So they can clearly do both. In what sources? Plenty of authors make mistakes. Unless it's in a codex, that's all I'm going to chalk it up to. That or flukes. Tyranid ships are notoriously difficult to detect despite being huge alien monsters they are lost in the background radiation of space. this could be related to the psychic stealth that the hive mind can use in Hive Battle. The tyranids could block the scans as well! Hull directly behind the main deflector dish. bays directly behind the main deflector on Decks 32-38.
instructed to sweep the objects from the vehicle's flight path. for manual intervention if possible. A mobile ship like the Enterprise D has an effective sensor range of 17 light years and it can detect gravimetric distortions. In other words, the Tyranids very method of FTL immediately signals their arrival far in advance. Probes, subspace telescopes, and simple defenses would allow the UFP to have days in advance of a Tyranid invasion. Only the most outer, smallest colonies would possibly be taken by surprise--and even then they'd be able to radio ahead well before the Tyranids actually arrived in system. this does not prove that the star trek ship can detect all life on any planet anywhere it just shows they can detect life on a planet. You are making the assumption that they have done so perfectly. LAFORGE: He was right over here. DATA: I am detecting no animal life within fifty kilometres. However, I am reading extensive animal remains, mostly fossilised. DATA: We appear to be caught in a temporal wake. DATA: The atmosphere contains high concentrations of methane, carbon monoxide and fluorine. DATA: Population ...approximately nine billion. ...All Borg. Data was not only able to determine Earth's population with the sensors, but he was also able to determine that all of them had become Borg. Again, not the first or last time that we've been shown that they're capable of determining not only population number, but type. You have gone beyond the scope of my comment since you said that starfleet would catch warning signs of tyranid spores before they reach the planet. I said that if spores are falling on a planet then the warning sign should be the planet surrounded by tyranid ships. You have not read my post correctly. Tyranids drop vanguard organisms quite a lot but they dont always have to. Then we go back to the previous issue. Tyranid scouts also perform spectroscopic analysis of stars and solar system emissions to find planets to target. Tyranid cults form on planets when genestealer cults are engendered. But they dont need genestealer cults and the vanguard organisms can spread over multiple star systmes meaning you cannot just concentrate your forces. Except while fleets do spread out into arms, they don't spread out to more than a few dozen. And Starfleet's going to be able to monitor those arms thanks to their ability to scan their FTL drive from a fair distance. And then they're going to adjust their tactics to meet the oncoming tendrils. What excuse? It's how American TV works. George Lucas made it popular and it's remained a staple of Stargate, Babylon 5, Star Trek, and Andromeda. Or do people not really toss each other across the room because the people themselves are clearly flopping and bodies are entirely in the wrong positions? Or do those spaceships in Plan 9 from Outer Space actually fly via invisible string in space? Also the virus didnt result in total destruction of the tyranid since tyranid forces still survived on tarsis ultra and the planet was reclassified as a tropical deathworld in The Heroclitus effect short story. It was originally a temperate planet with severe cold weather periods. Hive fleet leviathan was not defeated. If it is a chain reaction weapon then surely it needs a medium to propogate through. Also tyranid ships are heavily armoured with rapid regeneration and their own defensive biology. The biometric warhead was designed to hide the nanoprobes from species 8472 so it probably wont work on tyranids who rapidly adapt to attacks. The bombs are for planetary use. They can effortlessly blast the Tyranids into vapor with their phasers and photon torpedoes. If the nanoprobes were delivered by phasers and torpedoes then it is more likely that they were modified to not be doing their damage normally. Otherwise a borg drone should be armoured in nanoprobes since they can stop capital ship weapons fire. Granted. Of course, 8472 was able to effortlessly survive Borg weapons. Even if we just put them on par with Starfleet weapons (unlikely), 8472 is far more durable than anything the Tyranids have ever faced. Tyranid armour uses inorganic elements such as the alloys derived from hyperdense adamantium ore for example. It doesn't really matter. Any armor, regardless of being organic or not, that can survive a nuclear warhead, is going to be much more durable than something that can be penetrated by terajoule level lasers. Also a tyranid starship is not the same as a human being, the toughest example of an organic life form destroyed is a human. Are you proposing that a thalaron pulse will destroy diamonds? Even if you go with that route, they're still vulnerable to Borg nanoprobes. Basically, I'm going to address the issue of Starfleet technological advancement over that of Ork and Imperial tech ground-wise. reversible CNS damage result from repeated long exposures. levels of vibrational warming are evident. The damage index is zero. significant levels of thermal radiation. The damage index is 1.
trauma. Structural materials exhibit visible thermal shock. storage effects within metal alloys. The damage index is 3.5.
affected. The damage index is 7.
at this level. The damage index is 15.
effects become widespread. The damage index is 50. The stun settings are mostly nonlethal, but being stunned repeatedly is apparently bad for your health. In addition, getting shot in the head at point-blank range will typically result in death. The higher effects can be lethal, with even setting four leading to serious central nervous system damage and burning of the skin, the truly lethal setting is of course, setting 7, which will instantly kill most lifeforms. thickness begin exhibiting energy rebound prior to vaporization. energy, 0.55 sec delay before material vaporizes. ore of 6.0 g/cm3 explosively uncoupled per discharge. rock/ore of 6.0 g/cm3 explosively uncoupled per discharge. Level 11 will destroy a 2.155 wide, 2.155 long, and 2.155 high meter block of rock. Level 12: ~3.7 wide, long, and high meter block of rock. Level 13: ~4.49 wide, long, ad high meter block of rock. level 14: ~5.4 wide, long, and high meter block of rock. Level 15: ~7.18 wide, long, and high meter block of rock. Level 16: ~8.7 wide, long, and high meter block of rock. To give you an idea of how much rock that is, consider that your average human has a height of 1.5 - 1.8 meters. For your purpose, people from the US tend to measure close to the 1.8 meter range. This block of rock is both 2.115 meters in length, width, and height. So, assuming your from a first world nation, this block is going to be basically your height+ in those dimensions. That's setting eleven. To the higher end, an Abrams tank's hull (sans the gun) is ~8 meters in length. This block of rock would be as long, wide, and as tall as a Abrams tank. Take note that at 1,200 yards, there was a small shockwave/debris (basically a gentle breeze, but Spock and Kirk had taken cover). As a note, at a distance of 1,200 yards, that equates to 1.09 kilometers and it was considered fairly close range for them. In other words, the shockwave was powerful enough that despite the distance of a kilometer, the very edge of the shockwave breezed over them. Now, nukemap and HYDESim ware what I typically use. HYDESim is great for calculating the shockwaves of weapons, but the new nukemap has also added in a great deal more tools. Unfortunately, anything below 1 kiloton isn't as accurate since it scales from the 1 kiloton range. HYDESim's flaw on the other hand, is that it only accounts for ground detonations. By their nature, ground detonations appear to create smaller shockwaves--this in turn requires someone in this case to pump up the yield to account for that. HYDESim also gives us .25psi and .1psi, where as Nukemap only gives us down to 1psi. That said, even with the self-warned rounding issues with nukes below 1 kiloton, the two seem to be more or less in step when you look at equal yields at surface detonations. 5psi for both is 100 meters (.1km/.06 miles) or 1psi equating to 250 meters for HYDESim and 260 meters for Nukemap. However, since I think that the yield displayed in the episode was closer to an airburst and would make more sense for Starfleet to optimize it, a 10 ton bomb exploding at a height of 100 meters would have its 1 psi stretch out to 680 meters. Kirk and Spock would be farther from this still, as they were 1.09 kilometers away. However, I think this is a good minimal approach. You could probably, out of concern for conservative yields, reduce it to 5 tons, but 5-10 tons is basically what we're looking at. As a foot of note, the American shoulder-launched rocket nuke, the Davy Crocket, had a yield of roughly 10 tons. So that Starfleet has these in mortar form is well within the realm of reason. Just to take us back to our calculations of 40k macrocannons, the yield of the new options has also given us a different look on how a bombardment would work. The quote in question indicates that a "direct hit" from one of the shells/plasma bolts/laser beams would result in immediate destruction. This seems to indicate a surface detonation. This is great if you're trying to make a bigger hole, but not so great in regards to area effect. The difference isn't too great, but you're going to get lower estimated injuries. However, given that these weapons are designed to impact, it's rather logical. In any case, I got a yield of 1 kiloton for their macrocannons. This is a small Federation class starship known as a runabout. It's basically a ship that's designed to enhance the operations range of a starbase. It can reach up to warp 5 and is highly modular; you can have four cabins, two cabins and two research labs, and so on. Combat wise they're on the light side (that is after all, not their purpose), but they're armed with half a dozen small phaser banks, each of which, if we assume has the same output of phaser set to 16, is more than enough to overpower multiple Abrams tanks. It can also be upgraded however. One is a minor sort of combat enhancement; a microtorpedo that's about 13.3 inches in length and uses multiple warhead variants. In the case of the image above, you can see a rollbar towards the top-back of the ship. That carries up to four full scaled photon or quantum torpedoes. The runabout itself is about 20 meters or so long, making the rollbar roughly five meters long. So ideally, something as small as even an Abrams tank (roughly eight meter hull) would be able to carry something like that rollbar (you'd have to alter the dimensions a bit, but meh...) and could also be armed with multiple phaser banks like the runabout, including a more powerful version main gun that could say, range up to 2-4x the power of the rifle. This one tank would be able to effectively not only destroy anything the Imperium decides to throw at it, but it could also act as a long-range artillery with nuclear capabilities. This is the Federation Peregrine Falcon. It was used by the Maquis in DS9 and we saw that it's also a staple of large fleet actions by the Federation. I don't know its warp capabilities, but I suspect it's probably around Warp 3-5, in order for it to be at all useful, but to also justify the purpose of the Akira. In any case, the ship is warp capable and has massive impulse engines. A Bajoran Fighter has an acceleration of 15.6 km/s. Or 1,560Gs. Given the technological disparity between Bajor and the Federation, you could say that this UFP fighter might eek out 16-17 km/s. Interestingly enough, according to a Cardassian officer in TNG, the Maquis had armed their fighters with Type VIII phaser banks, suggesting that in a pinch, Starfleet could also alter their fighters to carry such heavy weapons. With just one emitter, they could destroy a 2,437,500 cubic meter rock, or a 165 meter asteroid. Roughly equal to 812.8 tons of explosives. Not much compared to their photon torpedoes, but it would certainly enhance their ability to inflict damage (though I imagine the drain is going to be much greater on their power reserves). This brings me to my next point; shields. Now, the personal force field of a Starfleet Officer, if in use, isn't that great. We saw Worf rig on up and it was able to function for a short time and deflect old Western bullets, but that's about it. However, a camp forcfield, like the one that Soran erected on Veridian III, had a rating of 50 gigawatts. Taken at face value, it would be able to dissipate a 1 ton bomb without trouble. However, we run into a bit of a snag. The first is that shields in the TM are rated at producing outputs in the megawatt range. The Enterprise has a total of 10 shield generators; five in the primary hull, three in the saucer, and one each in the nacelles. Each generator on its own can reach a peak output of 473 GWs for periods approaching 179 miliseconds. Otherwise, in combat mode, they're working at 2.688 GWs. Presumably, this means that in regular combat, shields are operating at 2.688 GWs, but can be pumped up to 473 GWs each in the even that a torpedo hits their shields. It would take the brunt of the damage. This seems bad--rather laughable when you consider how little 500 GWs is compared to the effects of a phaser or a photon torpedo, but keep in mind that the GCS can repel similar-level firepower and we know that phasers don't work via DET...and these shields may not either. In any case, in addition to these ten, each hull has four back-up generators for an additional eight. No doubt these are to take over when an area is hit with a photon torpedo, causing on generator to overheat and another to take over. In any case, the idea that Soran has a generator that is putting out 10 gigawatts a second seems a bit much considering that even a single generator on a military-grade starship is limited to 2.688 GWs for long combat durations. It's possible however, that the generators are rated with a peak efficiency of up to 10 GWs similar to the GCS's 473 GWs and Soran just misspoke (or not--it's possible the generator was fairly simple and pumped itself up to 10 GWs to repel Picard). In any case, assuming that this is what's really going on and assuming it's 376x less powerful than its peak like the military grade stuff, the actual typical output would be closer to the lines of 26.59 MWs. That's a great deal more sensible I think. Unfortunately, it also makes it impossible to determine just how powerful the field actually is. All we could say for certain though is that it would probably require more than a simple field phaser to penetrate the shield. We can make an educated guess though. If we assume that 473 GWs is enough to absorb a single photon torpedo at close range, then we can get a rough estimation. Assuming the torpedo is detonates in a sphere size (wasteful, but not unreasonable--good in case the torpedo misses and detonates in an area effect), then the total energy absorbed by the shield is 12.22 megatons. This is equal to 51.12848 petajoules or 51,128,480 gigajoules. It would therefore follow that a shield could dissipate 108,094.03 gigajoules of traditional energy for every 1 gigajoule it generates. So its factor is 1 joule = 108,094 joules. So in this case, the peak efficiency of Soran's shield generator would actually be 1,080,940 gigajoules or 1.08 petajoules. In effect, you'd need a 258 kiloton bomb to penetrate that shield, or bombard it with numerous other attacks that equate to that, since this is its peak output, its actual typical output is 26.59 MWs, you'd need 2.87 terajoules. Or a 685 ton bomb. What this shield counts as however, is unknown. It's worth noting that Soran basically had the Duras sisters by the balls with his new superweapon he'd gifted to them in return for their help, but the Duras are also exiles. Still, we can probably assume that he got a fairly high quality generator that you wouldn't find on anything other than a long-term camp with a portable field generator. Because we also have two other types of planetary-based shielding we need to cover. The first is the one that covers a military base or a small town/city. We know these to be in existence thanks to the episode Nor the Battle to the Strong, in where Jake and Bashir go to an outer colony that's been attacked by the Klingons. Basically, the entire planet is under siege. It's worth noting that one of the settlements, which was holding out against a couple of Klingon ships with orbital superiority and it was doing it with portable generators at one point. The problem is, we don't know how far the Klingons are willing to go. We know they storm the settlement with troops when the shields fall when if they'd wanted, they could have just nuked the settlement into oblivion. But then again, we have to consider the mood at the point. The Klingons are politically hostile to the UFP at this point, but it's more due to the lack of support they're getting from the UFP, not that they actively want to wage full war. In addition, they doing this under the idea that they still have claims to said colonies. In which case, it seems that simply just bombing them with a photon torpedo or any antimatter-based weaponry is out of the question. Doing so would initiate a full-scale war with the UFP and there's likely treaties that they observe with the UFP and other powers to prevent that. In addition, even the more aggressive imperial Klingons from TOS preferred to capture, not destroy colonies. This leads me to believe that any attack on the colony was mostly with non-nuclear/antimatter based weaponry (such as safer chemical warheads) or through the use of disruptors, which while devastating, don't produce nasty side-effects. In addition, their output is most likely more easily controlled. In which case, this means that the Klingons were fighting a war of attrition rather than bringing about their full strength to dispose of the colony. If we were to assume that say, the colony had one or two equivalents to Starfleets GCS shield generators, it would take considerable time to overwhelm the generators with disruptors due to their overall lower power output. However, we also have the Battle of Trelka Five. Although amusingly, the starbase is actually a normal base. On a planet. Still, despite that oversight, it was implicated by Sisko that it would take half of the Ninth Fleet to destroy Trelka Five. That's easily hundreds of ships (well, perhaps not...we have no idea how much of the Ninth fleet is left at this point), but Martok intends to attack it with just five--five Birds of Prey. Basically, his plan is to damage the base with a surprise attack and then push deeper into their territory. The plan was to send in two BoPs to hit the base, then have them leave system and when they were repairing their base from the first attack, the Klingons would swoop in with the other three and hit it again, then take off. DUKAT: Damar, let's not spoil this special moment with predictions of doom. Even you have to appreciate the audacity of Captain Sisko's plan. DAMAR: Personally, I think we'd be better off launching an orbital assault on Gowron's command centre. A full spread of photon torpedoes would take care of him, the Klingon High Command and everyone else within a few hundred kilometres. ODO: You should ask Dukat for some shore leave. I think you've been in space too long. DAMAR: Why? Because I'm willing to spill a little Klingon blood to get the job done? O'BRIAN: Shelling Ty'Gokor won't get the job done. You'd be lucky to launch one torpedo before they shot you down. Besides, even a dozen won't penetrate the shielding around the command center. According to O'Brian, even a dozen photon torpedoes wouldn't penetrate the shielding of Gowron's command center, which is located on a planetoid (fairly large one, considering its round). SULU: The force field is weakest on the far side of the planet. We can send down a shuttlecraft carrying a team in environmental suits. MCCOY: It won't work, Scotty. They'd have to cover thousands of miles through poisonous atmosphere before they'd ever reach the asylum. SCOTT: Aye, you're right. Even if they made it, they couldn't carry anything powerful enough to break through the asylum dome. Only the ship herself could do that. As Sulu indicated, the force field was weakest on the far side of the planet away from the nuthouse. In order for this to be possible, it would mean that the entire planet has shield generators and emitters covering the planet (this seems to be a standard rule for these places, as another asylum had a similar set-up). It's also interesting that despite the fact that they probably have mortar launchers with grenades in their stock, that they wouldn't have anything powerful enough to punch through the asylum dome, suggesting that only the Enterprise would be capable of that herself. This would suggest, as we discussed that the dome itself could probably resist several dozen 10 ton explosives without any sort of shield generator to back it up. The idea that they'd have toruble trying to cover thousands of miles through poisonous atmosphere seems rather strange given that they'd be taking a shuttle down, but it's possible that there are other planetary defenses such as phaser or laser cannons that could possibly shoot them down. Which makes sense, since we know that even archaeological sites in TNG are armed with a few phaser banks and at least one torpedo launcher--and their shield only covered a small area of the planet (ie, a nearby archaeological site). Another example would be the Lights of Zetar, where Kirk thought that Memory Alpha might have a planetary shield of some sort (but was corrected by Spoke). We also know that the small asteroids in the Neutral Zone in the episode Balance of Terror had shields over them as well, and they were implanted a mile deep in an asteroid. PICARD: It's defended by Starfleet. You don't think they're just going to stand by while we walk in there and take whatever we want. BARAN: I'm familiar with the tactical situation. VEKOR: What are their defences? BARAN: Nothing to worry about. They have a type four deflector shield protecting the outpost and the ruins. PICARD: They also have a minimum of two phaser banks and possibly photon torpedoes. Is that enough to worry about? Picard is undercover by the way. He and Baran indicate the outpost's defenses; a type four deflector shield and at least two phaser banks. Picard may have been bluffing about the photon torpedoes, but it seems clear that this is a possibility with a more defended outpost or world (the planet itself was uninhabited, save for the outpost). Given this, your typical planet probably has at least a couple phaser banks per settlement, unless it's heavily settled, in which case they'd be spread out more properly like our own military outposts and probably at least a few torpedo launchers with a small stock to stall invaders or repel raiders. We can also presume that even small colonies have at least a wing or two of Peregrine fighters. We know that even the small Federation outer colony the Klingons attacked had hoppers for troop transport (transporters were being jammed by the way). So even attacking a small colony with a moderate force of ships is going to be a danger to the Imperium or the Orks. As established, 40k macrocannons are limited to a kiloton and their lances are probably at best around a dozen or so terajoules. A single photon torpedo is going to hit with the force of a god's fist and probably either cripple or outright destroy all but the largest of ships with one hit--a grand cruiser might survive a few more hits. This is just from a ground-base torpedo launcher, let alone what the Peregrine Fighters can do. Think I'm kidding? Think of it this way; the Orks move in, their weapons are already hitting from long ranges to bombard the planet. About 30-45 minutes later, six Peregrine Fighters take to space. The two are still millions of kilometers apart, so the Orks aren't worried. Except, the fighters engage their warp drive and move to flank the oncoming fleet. The Orks don't have FTL sensors, so for all they can tell, the fighters just vanished. Before they can figure out what happened to them, the fighters have flanked them and are releasing photon torpedoes. They fire from absurdly far ranges for fighters (ie, fighters tend to engage at one VU--10,000 km or less) and with four photon torpedoes each, they've got two dozen torpedoes between the six of them. At high impulse, the torpedoes are going to move at velocities of .75c or higher, ensuring that there's very little way for the Orks to focus enough firepower upon a single torpedo to destroy it before impact. Even assuming the shields eat some of that energy, and causes the torpedo to detonate at 100 meters away, the torpedo would still vaporize the equivalent to 34,846.446 milimeters, or 35 meters of armor. Even if you claim that adamantine is 10x stronger than military grade titanium ounce per ounce, the torpedo would still eat three meters of it. So maybe you might say that given the thickness of their armor, that they survive. Sure. Okay. Except Peregrines can rapid-fire their torpedoes. So just after your shield drops from the first one, say the second one detonates 5 meters away. that would vaporize 13.938 kilometers of military grade titanium--at the speed of sound. Which is more matter than an Ork Kroozer is actually made of. Or even something akin to what we have in modern day, where it just bombs them from a far distance. Starfleet has countless ways of utterly gutting any planetary invasion force that would someone manage its way onto a planet. And it ranges from low-yield photon torpedoes that could be launched from the other side of the planet to simple drones or artillery pieces. But let's look at the Imperium, shall we? KIRK: Keep him alive, Bones. I want to know what's been happening here. SPOCK: Getting another life reading, Captain. SPOCK: Not survivors. Not warm-blooded. Living creatures, but not human. SPOCK: Azimuth ninety three degrees, range one five seven zero yards. KIRK: If they lower those screens to beam us up, they'll be open to phaser attack. SPOCK: We're hopelessly outnumbered here, Captain. It's those disruptors versus our hand phasers. KIRK: We're stuck with it, Mister Spock. We'll have to make do with what we've got. KIRK: Kelowitz, Lang, flank out. Lay down fire on co-ordinates Mister Spock gave you. Even if you don't see them. Keep your heads down. Now, at the time of the attack, Kirk, Spock, and the others were limited to only hand phasers and according to Spock, they only had disruptors. and yet, even at a distance that Spock mentioned--1,570 yards or 1.43 kilometers, they Gorns were still able to hit them from that distance and presumably given Kirk's orders, they had a chance of hitting back with their phasers. We also know that phaser rifles have holographic targeting displays, so no doubt they're even more accurate and could possibly produce even greater ranges. This puts the Federation's equal of a hand pistol at having a range over double that of the man-portable las-cannon (600 meters)--far better than the Las-pistol's 60 meter range. However, that said, even a lasgun will kill a Federation soldier with a decent hit and we already know that bolters are akin to small anti-air guns (though with less range) and would probably kill a normal human in a matter of seconds. Overall, their guns are considerably more powerful and in some ways, more advanced than modern day weapons, but they fall well short of Starfleet's sidearms, let alone rifles and mortar launchers. of industrial tech levels and higher can field artillery. infantry units. Light artillery has a range of 5 kilometres. Okay, so light artillery, which consists of mortars and shoulder-fired rocket launchers can reach up to a range of ~5 kilometers. That's not too bad, but consider that the modern US M120 Mortar has a range of 7,240 meters. Considering that Starfleet is from Earth's future and the fact that they fire nuclear artillery, their small 1-2 man mortar launcher could easily fit into this range (it was mentioned in the episode that targeting someone within 1km of them was 'a little close for one of these jewels'). information from forward observers to deliver their ordnance. Medium artillery has a range of 20 kilometres. Again...this is far below what Starfleet needs. Simply taking a counterpart design, the artillery piece would have state of the art sensors, which if they're even as good as a tricorder that the officers carry around, will have an effective range of 40 kilometers. In reality, the sensors are probably going to be a great deal more powerful, probably capable of picking up targets within hundreds to thousands of kilometer ranges and given how good Starfleet torpedoes are, they could probably launch a something at that range as well, though it would probably not be something as large as a photon torpedo. In fact, they'd probably use a mixture of microtorpedoes for hitting small or unprotected targets, they could use a 10-ton yield anti-matter missile similar to the one like the Arena in yield, and bulk it up to several hundred tons or low kilotons for a heavy weapon. In Nor the Battle for the Strong, the Klingons fire artillery at Jake and Bashir from a long ways away. What we see isn't too impressive, but we learn later that the same artillery unit destroyed the Runabout that Bashir and Jake had taken to the planet. Considering that Runabouts have gotten into fights with Maquis fighters, that would suggest that at the very least, have phasers on par (and likely exceed) their hand phasers. Even if we assume they're only as powerful as hand phasers, that still paints them as having the ability to tank several shots equal to .2 ton bombs. up to a range of 40 kilometres. If a smaller, more mobile artillery piece can scan and hit something hundreds of thousands of kilometers away on its own, I expect that Starfleet's version of a heavy artillery piece is probably going to be capable of hitting most targets from just about anywhere on the planet. The only difference between them and an actual Starfleet base would be that the former is mobile, making them a harder target to retaliate against. In regards to armor, nothing except perhaps the Baneblade tank comes anywhere close to being as powerful as anything the Federation could make. And given that a Federation hand phaser can hit targets at a range of 1+km, I'd expect that something akin to a light or heavy tank would be able to hit anything with its phasers that isn't over the horizon. And do it with firepower that's probably several times greater than that of a hand phaser. Hell, its secondary phasers would presumably be as powerful as Starfleet hand phasers. In a similar vein, air forces against Starfleet is going to be just as pointless. Their standard fighters are capable of engaging ST capital ships in large fleet battles and I've already shown that a single wing would devastate a small invasion force of capital ships. Any sort of anti-air force or interceptor Starfleet has is going to pants their airforce without any trouble. Even their heavy air forces such as the Starhawk bomber only have a 1km combat range for their guns and 20 for ordnance. Again--a hand phaser comfortably exceeds its power and range. The most horrific part is, that due to the slower STL velocities of Imperium ships, it would take them weeks, if not a month to reach most habitable planets upon entering the solar system and marking themselves as hostile. The planet would be able to hit them with fighters in probably hit them within hours of them entering the system. Even with a large enough force, by the time they actually reach the planet, they'd have taken heavy causalities over the course of weeks--then they get to fight the planetary defenses! Man Hellblade, you're passionate about this eh? That's... a LOT of information to shift though. Tell me about it, each post took several hours spread throughout a day. I'm resting today. Well, most of my quotes come from the TMs, as I've noted. I'm not entirely sure what you're talking about exactly. I borrowed pics (that took me forever--half the time I get falcons, the other times I get other sci-fi Federation fighters...). The rest is just knowledge that I've accumulated over the years. The phaser calcs themselves are a mixture of the Daystrom Institute and me scaling from the phasers. Most of the episode transcripts I took off a site that has all of Trek on them (save for the recent movie--don't spoil it for me please). I also obviously used Memory Alpha, Wong's Calculator, and such. Other stuff, like the phaser tank and artillery stuff is just me adding simple one and one together. I must say though, that what took me by surprise was how much I like the UFP Fighter. I've seen it before, but it was almost never in any good shots, so it always looked terrible to me. 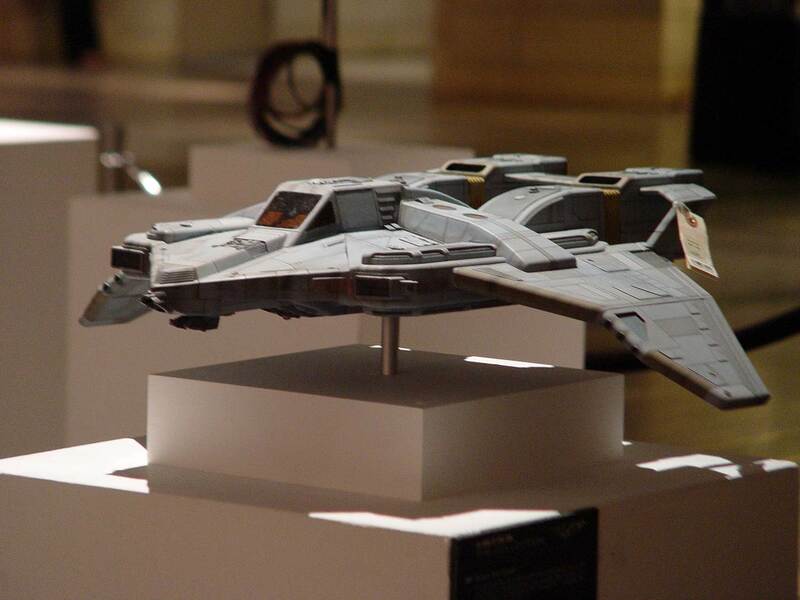 But a few CGI models (even if somewhat inaccurate ones) and the actual model pics brought me around. They are some really nice pieces of tech. It was fun, but geeze, it takes a while to composite all the information. Ok, so let me summarize why Star Trek would win this fight. If we're using high end showings for both universes, Star Trek massively outclasses 40k. If we're using medium showings for both universes, Star Trek STILL outclasses 40k. The only way 40k wins this fight, is if we use high end calcs for them, while ignoring high showings from Trek. EVEN THEN Trek has 8472, Borg, Voth, Organians, and, dare I mention, Q. The IOM is boned, no matter which way you slice it. The Necrons, Eldar, Orcs, ect. won't be much help either. Throw time travel into the mix, and THERE IS NO DEBATE. Hell, 40k doesn't even have a population advantage, unless you limit the fight to just Federation vs IOM. The only way 40k can win this fight is if you mercilessly gimp the Trek factions, while claiming Bigatons and Transwarp speeds for 40k. That's dishonest debating. The Imperium has only one true superbeing that it can throw at the Q and such, and that is the God Emperor. Now he did manage to wipe a being of immense power (Horus) not only by extinguishing his life but eradicating is essence from all existence. So he could never return to the warp to be reincarnated by the forces of chaos ever again. SO in that regard yes ST does win. Now to establish something, who has more authority in the actual output of weaponry for their universe, a fanboy... OR THE OWNERS OF THE INTELLECTUAL PROPERTY WHICH TRUMPS ALL! PERIOD! ENOUGH SAID! They own the property rights to said universe, they are essentially God to it. Making disputing said facts, irrelevant! Now here in space, ST runs into problems... and many. But I will compare specifically firepower between the two establishments most associated with their universes. The Imperium of Man and the feds. A sovereign class phaser bank emits 5.75MW of power or 5.75 M(J/s). It has 15 of these. So all banks firing comes in at 86.25MW. Or just over 1/17th the output of a modern nuclear power plant! LOLS! A photon torpedo yields 64MT or 12MT more than the largest bomb detonated by humans. The feds also compete with the other standard races. Lets look at a nova cannon, found on any cruiser which is approx 3.5km in length. Now a naval round today is approximately 20 times longer than its caliber. A caliber of 50m on a nova cannon, again found on cruisers for the IOM which number in the hundreds of thousands. That round is a kilometer long, don't worry the gun is 3km long welcome to 40K. So now the IOM accelerates this round to about .9c or 9/10ths the speed of light. Things get wonky as you are accelerating essentially 1.9 cubic kilometers to near luminal speeds. I used steel for my calc but really this is a hollow round but I will address that later. And the result is..... 500 yotta-watts of output. Look it up on wikipedia and weep! Now this round is packed with plasma warheads which come in at about 2.5 times the kinetic energy in the gun. So 1.25 somethin-watts. To compare we are essentially comparing a number in kilometers to a number in astronomical units. Or 411 peta-tonnes of explosive power, which takes out an area of space, the size of a small planet. Put 411 peta-tonnes in a nuclear blast calculator it covers earth many many many times over. Now the broadside of this ship may only be in the terratonnes range but well, that's still far beyond anything that is typical in the ST universe. Now that hollow round is full of plasma warheads, they may weigh more or less than steel, but the adamantium shell encasing them is much much much heavier than the steel! So there is possibility for minor error here however I think I would be leaning to the understated power in this regard rather than overstating it. ST ships engage at 80 to 90 thousand kilometers? Imperium of man engages at 2-3 AU, ok no comparison there. So. Time travel. Although ST has much more controlled time travel, the Imperium of mans ships can do this by their FTL technique but a lot less accurately. So tracking down all the temporal anomalies would be a nightmare for anyone to sort out. IOM ships can arrive 400 years before they left and they have no control when this happens. They can also show up eons after they left on a short hop or be lost to the warp altogether. Basically when the IOM goes FTL they have no clue where or when they will show up so how could anybody else. The problem here is they show up on a world 5000 years before they build their "time ship" at which point they would proceed to promptly glass that planet! Like I said the temporally anomalous nature of IOM FTL could be more than ST could handle. It's not certain though. Umm. As for ship durability, those terraton broadsides those cruisers project, IOM ships can withstand for days at a time! A nova cannon round stands a small chance of crippling a cruiser. Their shields are alternate dimensions. Ya. ST ships are completely and utterly outclassed. You gotta hate it when the intellectual property owners produce hard "real world" stats for the things in your universe because it lets science rip them apart! Oh and Q. Q and the chaos gods. Q and as we have seen from all the episodes involving him with his total inability to control his emotional state in any form whatsoever, feeding 4 gods whose power is determined by emotions. Whom are already all 4 omnipotent. Being fed by another omnipotent beings emotions. That's even simpler math than the nova cannon calcs. That's how Q would die in 40K.